This morning I watched Grant Fritchey's SQL Pass 2012 session about reading execution plans. I'd highly recommend watching it, or seeing it in person when SQLPass comes around again next October. 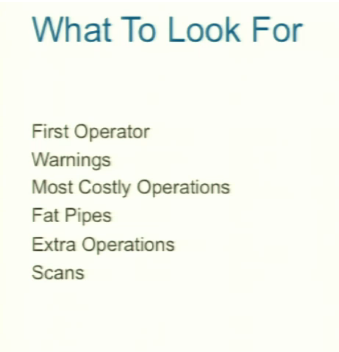 Grant had this slide to teach us where to begin when reading the cache plan. In summary, Grant says that execution plans can be overwhelming, but if you start with these six things, you'll probably find what you're looking for.